Arturo Cardelus has spent hundreds of hours on Russian lessons in the eight years since he moved to Moscow to build up the local operations of Ferrero, the Italian family-owned chocolate giant. The 69-year-old Spaniard admits that learning Russian — his sixth language after Spanish, English, Italian, French and Portuguese — is an obsession. "I have a Russian lesson every single day," Cardelus said in an interview. "Some people do not consider it totally essential. But I find it very important because the people in the sales force only speak Russian. The people on the production line only speak Russian. "If you want to motivate them, if you want to be close to them, if you want to guide them, you had better do it in their language. So this has become an obsession for me." 1999-Present — Ferrero Group, including duty-free director, Ferrero International S.A. (1999-2000); general director, managing director and area director for South America, Ferrero Trading Lux (2000-01); area director, Ferrero Middle and Eastern Europe (2001-04); general director, Ferrero Russia (since 2003); area director Ferrero CIS (since 2004). Weekdays at 1 p.m., Cardelus pulls out his home-packed lunch — usually buckwheat and tomatoes or a can of sardines — and listens for 10 minutes as his instructor summarizes the day's news in Russian. After that, the two converse and read for at least an hour. When Cardelus' wife is out of town, the lessons extend into the weekend: intensive five-hour sessions on Saturday and Sunday evenings. "I find speaking Russian is absolutely fundamental," Cardelus said. "I find it respectful. You know, you're in Russia, you have to respect where you are. It's a question of closeness to the people." 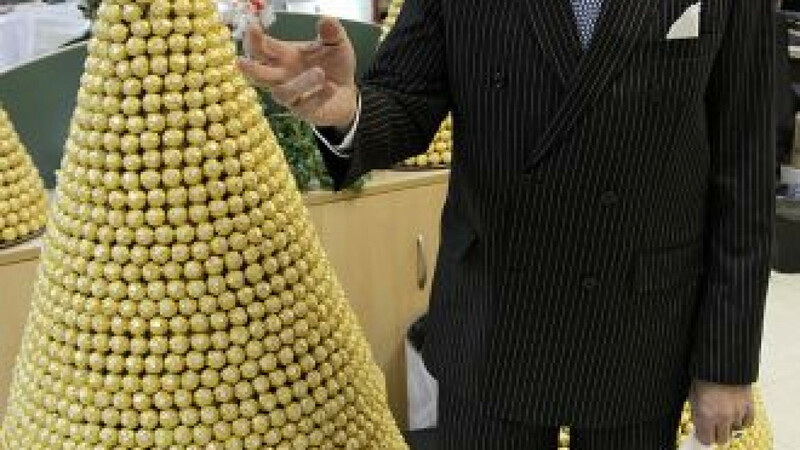 The people with whom Cardelus particularly wants to be close are the more than 2,000 Russians he oversees at Ferrero, the maker of Ferrero Rocher, Nutella, Confetteria Raffaello, Tic Tac and Kinder Surprise. As Cardelus ushered a reporter from the front desk to his office on a recent afternoon, he greeted members of his team, patting some on the arm and affectionately poking one young man in the side. The warm words and physical contact are part of a philosophy of "leading with the heart," he explained. But the idea, gleaned from the "Five Dimensions of Leadership" by Bill George, a Harvard professor and former chairman and CEO of Medtronic, is not just a philosophy, he said. It's a way of life. "This is not someone with a soft heart talking. This comes from a huge businessman teaching at Harvard Business School," he said. "Leading with the heart — this is something fundamental," he said. "The leader of the 21st century empowers people. It's not this idiotic approach of: 'No, I decide it, I said it, you do it.' That's not the way. You have to empower people. You should share objectives along the way, but the key is empowerment." Cardelus sat down with The Moscow Times to share his vision of leadership, including how a Harvard class provided a breakthrough moment, why he works on Dec. 25, and how his success is rooted in his grandfather, the prominent Spanish comic playwright Pedro Munoz Seca, who was killed in 1936 by a firing squad during the Spanish Civil War. Q: Why did you come to Russia, and why have you stayed? A: When I was working for Ferrero in Frankfurt in the early 2000s, I oversaw this entire area, which included Poland, Hungary, Austria, the Balkans, the Czech Republic, Slovakia and Russia. I realized — and you don't have to go to Harvard to understand this — that the future lay here in Russia and this country would go forward. I was coming here quite often and I could see it, I could feel it. So I spoke to Giovanni Ferraro, my boss. I told him: "Look, Giovanni, the future is Russia, and the best thing I can do for Ferrero is develop that country. So I would like to go there." He asked me, "How would your wife feel?" I said: "No problem. I'll go there. I'll live there. But there's one deal that you and I must make. You trust me, and I trust you. So give me a blank check." He said, "Arturo, you're right." And that was it. Giovanni gave me the firepower to really move forward. He gets full credit for Russia. We only had about 150 people here at the time, and now we have more than 2,000. We've grown very fast because we advertised, we hired and we motivated people. That was my commitment. I fulfilled my commitment, and Giovanni fulfilled his. That was the basis for this fantastic growth. We built a huge factory in the Vladimir region. Why have I stayed eight years? Because I needed to make the factory happen and grow. We built the factory only three years ago, and we obviously have to justify the investment and carry on growing the people. We believe in growing people. Q: What is your secret to successfully managing people and business in Russia? A: Managing people is the same everywhere in the world. Don't believe any of this talk about it being different here. The advantage I have is that I like people. I love people. And I can learn from everyone — that is my belief. When I ask the cleaning lady, "How is everything?" I'm sure I'm going to get something out of that. I've always been this way, and it has always worked in every country where I've lived. I talk to the heart of the people. I'm very close to people. By the way, I don't have a secretary. No, no. I have two cell phones, and people call me directly. We have two ladies who handle things like reservations, but I don't have a person who says: "Oh no, Mr. Cardelus has a meeting at 2 o'clock. You cannot see him." Values are very important. Look at all the stars there. [Cardelus points to a collection of paper silver stars affixed to the ceiling above his desk.] You see all the stars have words on them: "encouragement," "creativity," "openness," "humanity," "fairness" and "trust." These are the values that we push in this company. [Cardelus points to a row of silver-star trophies beside his desk.] I will be giving these stars to the people who represent these characteristics best. Q: How else do you promote values? A: The most important way is by example. You have to give a good example. Always. That's the key. If you fail — if you fail once — that's it. Your credibility is gone. I have never failed once. I have never dreamed of failing, of not being honest or trustworthy or credible. Never, never, never. It's part of my core being. This is the way I've always been. This is the way I've always run companies, and it has always worked. Here's an example: When I travel, it's very important for me to arrive back in Moscow on a Sunday, so I'm here in the office on Monday morning. That is very important, so people see you and they don't say, "Oh, he's traveling." Here's another example — this you will enjoy. I'm here in the office on Dec. 25. I won't be here this coming 25th because it's a Sunday, but on the 26th, I'll be here. Two years ago, the 25th was not on a weekend, and I was at work in Novosibirsk. Why? This is Russia, and I like to say, "Hey, here we are Orthodox." So on the 25th, I'm here. Yes, I'll go to church, but I am here because this is where the people are. I want the people to know that I'm here with them. It's respect. But I do take off Jan. 1 to 11 — absolutely, no question. Q: Where did you learn your values? A: My grandfather, Pedro Munoz Seca, was assassinated in the Spanish Civil War. He could have saved his life by writing in favor of the opposite side when he was in prison. But he didn't. That's honor, and I can never betray that. My mother and my uncles were always telling us about my grandfather when we were growing up. So this tremendous sense of honor was really instilled in us. I try to transmit these values to our people. A: First, my grandfather, my parents, wife and children. Another tremendous source of inspiration for me are my people. I just want to grow them. People are like the biblical parable of the talents. I have to leave them better than when I got them. I have to, or what the hell are we here for? You have to leave things richer, better. You know, when you go upstairs, our friend is going to ask: "OK, what did you do in life?" What am I going to say: "Oh yes, we made the budget every year, I never missed an appointment, I went to every meeting on time"? A: It's very simple: Look at the long term. Come with a strategy, but don't think for a second that Russia is a country where you can enter and then leave. Q: Could you describe a problem that you've resolved in Russia, and what you learned from it? A: I have never had a problem in Russia. I give you my word of honor. Furthermore, in all these years, I have never had a disagreeable moment in Russia. Q: How do you deal with corruption? business, very pro-investment, very pro-everything. I've never been approached for a bribe. But let me tell you something. I worked for about four years in a state company in Italy. When I left, I told my boss: "You know something? I've heard so many stories about bribery, but I was never approached." He replied, "Well, they knew that with you they couldn't get anything." It's the same thing here. No one has ever approached me with any kind of offer. Never. You have my word of honor. Actually, there are many companies that work without corruption, and there are several regions in this country that have zero corruption and are absolutely clean. No, I am not exaggerating. Now I cannot say this region or that region is clean, but I've heard that this is the case. I chose Vladimir for this reason. Q: How did Harvard affect your leadership style? A: Harvard offered a fabulous course called Interpersonal Behavior that really opened me up. The class was very restricted — there were only about 35 people — and run by a British professor. With the first case, the class just didn't click. The second case — this was 40 years ago, but I remember it like today — was about Gracia Hernandez, a Chilean lady who came to the United States and what she went through. The class just didn't get it. So I raised my hand and for the following 35 minutes I spoke. I spoke about feelings. I spoke about everything I had inside and what that little lady was going through. [Cardelus' voice breaks.] I still get emotional, because the class suddenly came together. I was a talker in the class, and when the others saw me speaking this way — so deeply, so earnestly, so emotionally — that made the change. From then on, every single class was a huge success because everybody could talk. People cried, people got emotional, and it was like a catharsis. It was really unbelievable. At that point I realized the enormous value of emotion, of clarity and of feelings, and the whole class did as well. It was fantastic. I know what people feel, I know what they have inside because I'm very open. As you can see, I'm extraordinarily open, totally transparent, and they respond to me. Q: It sounds like a key part of leadership is the ability to be transparent. A: To be — not the ability to be. It is to be transparent. I'm not putting on a show. No. I'm always very clear, very transparent, very open. I never try to play games. And emotions? Yes, I always show emotion. I hug people. I know most of the people who work here and I know if they have a problem, if their mother is ill. I'm very close to them. I'm also a very physical person, so I hug and I kiss — both men and women. It doesn't matter. That's my nature, and people understand that. As a matter of fact, when I took over here, I spoke with the two top ladies, directors, and I said, "Look, you know me, you know how I am, how I love people and I hug them and I kiss them. Is this something that bothers you?" And they said, "Coming from you, no." This is the same thing two ladies told me in 1975 when I put the same question to them at the American company Johnson Wax in Spain. I asked them right away, "Is it a problem because I am quite a physical person and I touch?" And they said, "Coming from you, not at all." There is nothing wrong with showing emotion. Lead with the heart.